It's House Mouse Monday, and the 108th Challenge! The challenge this time was chosen by our talented teammate, Stacy. 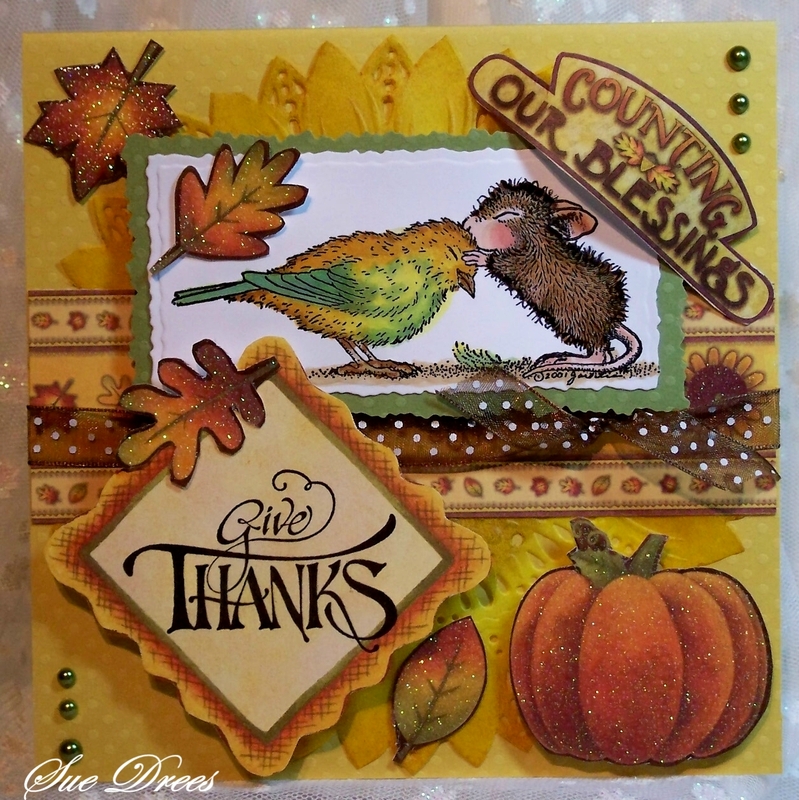 Stacy chose a Thankful or Thank You card, as easy as a sentiment saying Thank You. We welcome two new Guest Design Team Members for the month of November, Julia and Nana Connie, good to have you creating along with us. We hope you will ink up a House Mouse, Gruffie Bear or Happy Hopper Bunnie and join us for this challenge. Lots of beautiful inspiration at the House Mouse blog site by my fellow design team members. Stamp - House Mouse "Sweet Kiss"
Sue, Boy you really do this stamp justice. You colored it perfectly. I love the colors in your card, just evrything about it. Thanks for sharing. ooooooooooooo Sue, how precious is this image. Such a cute card dear. I love how you colored the bird and the mouse, Sue. Love the fall colors too. 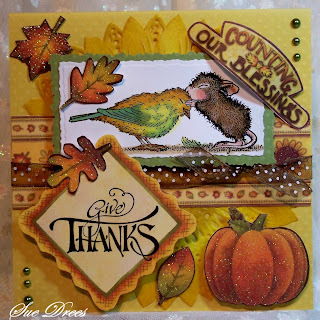 So "thankful" to play along with my friends at the House Mouse Challenge this month! oh Sue gorgeous card and sooo cute! Precious card Sue. You really colored this and designed the card beautifully. Sue, This is so incredible! I love this stamp and you've colored it beautifully. Perfect paper choices and great use of the dies. So happy to be creating along with such a talented team this month. :-D Thanks to all of you for the warm welcome! Awwww.... he just makes you smile kissing his forhead. How darn adorable, beautiful coloring Sue! Wonderful card! Your coloring is great! You did a great job! Beautiful thank-you card and just so sweet, love the image! The colouring is great and I love the design/layout. oooo...and what beautiful stamp have you used, so cute. Gorgeous Sue, I love those beautiful autumnal colours and details, I love your stunning detail and tha adorable images the sweetest thinks I've every seen!!! Sue, this is soooooooooo beautiful! I love the way colored the bird, such warm colors.